Why are international human rights norms plagued with the problem of huge gap between the promise of formal rights and the harsh realities that people they are supposed to protect experience on the ground? In answering the question, this paper investigates the right-reality divide of the human right of prisoners against cruel, inhuman, or degrading punishment or treatment. Using socio-legal approach in understanding laws as not existing in a vacuum and therefore not insulated from the socio-cultural and political economic structures of society, this paper argues that the rift between right and reality in the case of the human right of prisoners against cruel, inhuman or degrading punishment or treatment is due to the lack of full acceptance of this right by society. 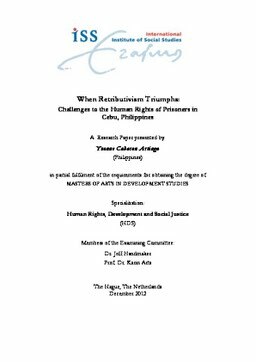 In conclusion, this paper posits that the non-acceptance of this right is caused by the dominance of the retributive perspective of punishment in society over the rehabilitative ideal set by human rights norms, leading to the nonrecognition and non-promotion of this right on the ground.